Kontram SmartCEMS is our QAL1 certified continuous emission monitoring system designed by our own product development team. Kontram SmartCEMS system consists of a sample probe, a heated sample line, a sample conditioning unit and high-quality analyzers from Thermo Scientific. The sample probe and sample conditioning has been developed by our own R&D team. Operations of Kontram SmartCEMS are controlled by a user-friendly touch-screen PLC. The system structure and the PLC-software are as well Kontram's own product development. In addition to facilitating the work of system users and administrators, product development has emphasized predictive maintenance, quality assurance of the results, and remote control. The main advantage in the Kontram SmartCEMS system is its ability to collect measurement data from the sample conditioning unit. For example, measurement data can be collected for: Dew point of the sampling gas to monitor dryer efficiency, flow of the sampling and calibration gas, sample gas vacuum and multiple temperature measurements. These measured parameters can predict the need for maintenance and thus maximize the usability of the device and save on the operating costs of the system. 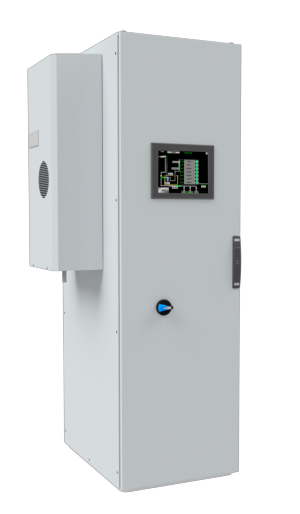 Kontram SmartCEMS system provides trend displays of all measured gas components and sample conditioning diagnostics, which makes maintenance anticipation easier, without interrupting any measurements. By means of predictability, it is also possible to maximize the efficiency of the system. Remote access can be used as well to check the analyzer diagnostic information and, if necessary, to change the setpoints and update system software. In addition to traditional mA messages, a Modbus or Profibus fieldbus is also available via Ethernet or RS-485. 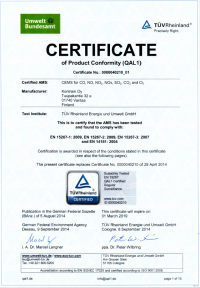 Kontram SmartCEMS system has been QAL1 certified by TÜV. We have been delivering our reliable continuous emission monitoring systems to our numerous customers already for over 30 years. When the CEMS project starts, our project department will prepare a precise schedule and assembly plan for the project. Equipments are manufactured always according to customer's requirements and needs. We also carried out the hardware certification required by the authorities for total measurement uncertainty (QAL1), which verifies the suitability of the measurement system for the application. The design and development of the equipment is always carried out accurately in accordance with the prevailing governmental obligations and the quality assurance standards related to emissions. We also always provide project documentation according to customers specific needs and requirements. The assembly of continuous emission monitoring system is performed by trained personnel under the supervision of Kontram. Before delivering the Kontram SmartCEMS to the customer, the equipment is tested at the manufacturing site. Customer's representative is always welcome to join the factory acceptance test (FAT) at our premises in Vantaa. Test report is prepared for the test results, which is incorporated into documentation. Our Technical Service group introduces the supplied measurement system to the customer and performs a hardware installation check. During commissioning, customer maintenance personnel are given comprehensive system operation and maintenance training. A protocol will be drawn up for deployment, which will show hardware configuration, test and calibration results and operating settings. Our professional technical service group offers complete service packages for tracking and reporting measurement results. In addition to comprehensive maintenance services, we also offer individual services and spare parts. Our Technical Service also offers accredited (FINAS T262) emission measurement services.